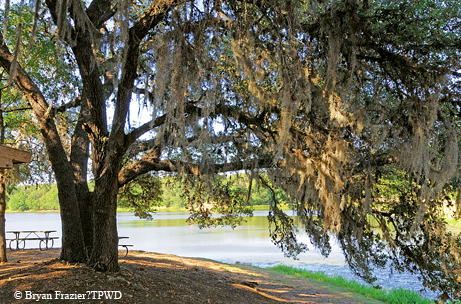 ﻿﻿﻿Buescher State Park attracts campers with trees, trails and a lake. ﻿﻿﻿Now that fall’s arrived, Tish Murphy will call her sister in Katy and schedule a family meet-up at Buescher State Park near Smithville. Then she’ll get back on the phone and reserve screened shelters for everyone. Quiet and secluded, Buescher (pronounced “bih-shur”) State Park was developed in the 1930s by the Civilian Conservation Corps and surrounds a 25-acre lake rimmed with towering hardwoods. Anglers regularly snag catfish, crappie, perch and largemouth bass. In the winter, Texas Parks and Wildlife Department fisheries personnel stock the lake at least twice with rainbow trout. Year-round, many visitors bring canoes and kayaks or rent some from the park. Almost 8 miles of wooded trails start in the park and wind north toward neighboring Bastrop State Park. The main trail roughly parallels the first 2 miles of Park Road 1C, a 12-mile scenic road that links the two parks. “My favorite part of the hiking trail is the Pine Gulch Loop that takes you from the top of a ridge down into a gulch, where you’re completely surrounded by pines,” Sartor says. Biking and birding top the list of other things to do at Buescher. Park Road 1C’s dips and hills challenge even the most hard-core cyclists. Along the road, trails and lake, visitors may glimpse pileated woodpeckers, one of more than 250 bird species that have been documented in the park.